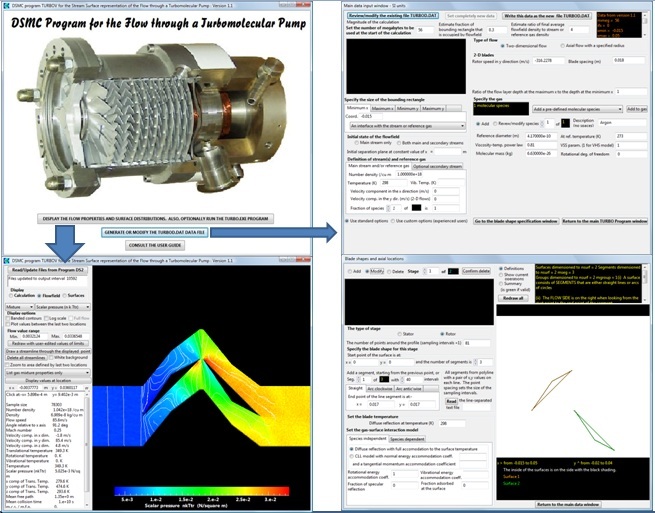 This is a dedicated visual interactive program for the two-dimensional representation of the flow through a turbomolecular pump. It is an example of the way in which the DS2V program may be customized for application to particular flows of engineering importance. The main modification is associated with time-dependent molecular transformations that allow an exact treatment of the rotating and static stages with a fixed computational grid. A paper entitled The effect of inlet guide vanes and sharp blades on the performance of a turbomolecular pump has been published in the January 2011 issue of the Journal of Vacuum Science and Technology A. The DSMC method is applied to a two-dimensional representation of the flow through a turbomolecular pump. It is shown that a conventional pump with a rotor as the first stage produces a significant disturbance in the vacuum chamber upstream of the pump. This disturbance can be prevented, without any adverse effect on the performance of the pump, by the addition of inlet guide vanes, similar to a stator, upstream of the rotor. In addition, it is shown that the compression ratio across the early stages that are in near free-molecule flow is significantly improved if the blades have sharp leading edges. The calculations required runs of just several hours on an ordinary PC. The vacuum community has only recently realized that the DSMC method is no longer too expensive, in terms of computational requirements, for application to rarefied flows in laboratory and industrial high vacuum systems.